A female assassin's past catches up with her. Like so many recent Korean action flicks, Byung-gil Jung’s The Villainess starts off with a humdinger of an action sequence. One is barely settled in one’s seat before being immediately thrust into the midst of a violent melee with arterial blood spraying in all directions. The film’s intricately choreographed opening sequence offers nearly 10 minutes of nonstop carnage from a subjective POV, as in a video game, with the audience taking the perspective of the mysterious assailant - shooting, kicking and stabbing their way through a corridor of bloodthirsty gangsters, OldBoy style. Having finally hacked their way to the room at the other end, the panting antagonist is now faced with the kingpin and his cronies, gearing up for another onslaught. When the intruder is thrust headlong into a mirror by one of the gang, we finally see that shockingly, it is a young girl – a black-leather-clad-killing-machine, certainly, but also a mere slip of a thing. This revelation finally explains the look of comic incomprehension on the faces of some of the victims that lie bleeding in her wake. Ok-bin Kim plays Sook-hee, a girl trained to be a deadly assassin since childhood - this opening bloodbath is her revenge on the thugs who murdered someone she loved. During this change of perspective to the objective, the camera work really begins to get crazy (at one point it seems like the camera is on a swing) setting the tone for the rest of the insanely inventive action sequences The Villainess inflicts upon us. Barely escaping alive from the murderous mayhem, Sook-hee is nabbed by South Korea’s Intelligence Agency, which recruits her as a sleeper agent. She accepts the chance to start a new life with a promise from her handler, Chief Kwon (Seo-hyeong Kim), of complete freedom after 10 years of service. Western audiences will see analogies with Hanna (2011), Kill Bill (2003) and the French film La Femme Nikita (1990), as like that female assassin, Sook-hee can gain her freedom only by killing government targets. Unlike Nikita however, Sook-hee is pregnant with her dead husband’s baby. He (Ha-kyun Shin) was killed on their honeymoon, but the Agency allows Sook-hee to have her baby and raise her daughter to toddlerhood during her training, giving them a means to exert extra incentive on their operative. After her training is complete, Sook-hee goes out into the world taking on a new identity as Chae Yeon-soo, a 27-year-old theatre actress and single mother. Hyun-soo (Jun Sung), an angel-faced charmer in the apartment next door, takes a romantic interest in her. There is certainly a mutual attraction, but, for someone whose previous existence has revolved around being an efficient killer, slipping seamlessly into a normal life is not an easy transition for Sook-hee. What complicates matters is that her new beau has actually been primed and planted by the Agency to keep tabs on her, and soon there are also indications that her erstwhile beloved spouse may not be entirely dead. Ok-bin Kim gives a marvellously committed performance as Sook-hee, expressing a subtle eroticism and, despite her femininity, striking features and petite frame, exuding a fierce energy in her combat scenes. Stunt coordinator Kwon Gui-duck and cinematographer Park Jung-hun present some outstanding vehicle chase scenes. Kwon stages an astonishing sword fight on speeding motorbikes at night in a tunnel, and a jaw-dropping climactic pursuit that starts with an alley fight, continues in a car accident, builds to car chase choreography and acrobatics as good as anything in Baby Driver and ends on top of a speeding bus. It’s impossible to tell where the live action ends and the crazy drone cameras and CGI trickery begins. Kim’s action sequences come across in unbelievably long-takes, but she is so fierce in the lead role that she needs little help to hold our attention. The fun is in the details, as when sniper Sook-hee picks off the obstacles around her target so that they crumple and give her a cleaner shot. Or when moments before her wedding ceremony, Sook-hee, in her wedding dress, is called upon to enter the venue’s toilet, fish out a sniper rifle and start shooting - and when she shoots someone’s sunglasses off from half a mile away, she gets the shock of her life. Western audiences will see references to several Western films (although Byung-gil Jung denies any influences) while seasoned Asian film fans will recognise Nikkatsu’s ’70s female exploitation films and Hong Kong’s long history of martial arts heroines, (Michelle Yeoh, Maggie Cheung, Brigitte Lin, Shu Qi, Maggie Q). 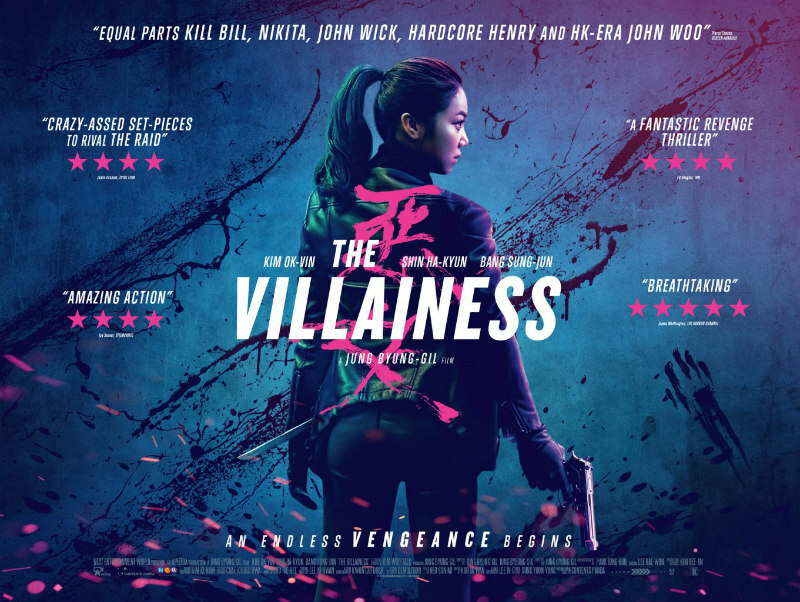 Nonetheless, The Villainess succeeds in being hugely exciting, offering delirious action choreography, breakneck pacing and even a dramatic, (if over-fussy) narrative thread. What is new about The Villainess is that it marries its revenge scenario to a melodrama of maternal suffering. She is a lover, a mother, a betrayed woman and an angel of vengeance, allowing Sook-hee to be vulnerable, tragic and ruthless. In the West, critics have generally admired the other current, female-led, action flick, Atomic Blonde. I too enjoyed Charlize Theron’s frosty secret agent being sent into a gritty '80s Berlin to retrieve information devastating to Western intelligence. Atomic Blonde is a triumph of style thanks to the outrageously beautiful, steely Theron, but she offered us a different kind of female protagonist - a cold, focussed, female survivor, with a hollowness at heart. The Villainess instead resembles Atomic Blonde director David Leitch’s other creation, John Wick. That film worked partly because Keanu Reeves’ Wick was allowed to show his heartbreak and mourning as he pursued his vengeance. The Villainess has a similar emotional core. The problem with The Villainess is a muddy narrative - there are plot machinations, layers of betrayal and a jumbled chronology containing some disorienting flashbacks which all contribute to a bit of a muddle. However, the lack of a clear and coherent narrative is nearly offset by a staggering performance by Ok-bin Kim in a film which contains the kind of grim melodrama, cartoonish violence, and mayhem and destruction that Asian cinema revels in, and that makes most viewers, gasp, laugh and weep, all at the same time. The Villainess is in UK/ROI cinemas September 15th.